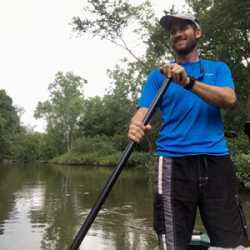 Aaron is a PhD candidate at the University of South Alabama and Dauphin Island Sea Lab, studying mangrove range expansion associated with climate change and the impacts on native wetland systems. Before spending some time as a fisheries observer in Alaska he studied oceanography. Looking forward, Aaron would like to become more involved with land management to sustainably balance ecosystem function and services with community values.